Layers WP is powerful and free WordPress website builder framework that makes it quick and easy to build your own custom website without worrying about the code. You can read our full review of Layers WP to decide if it’s the right WordPress theme framework / website builder for you. The Layers WP framework focuses on extending the core WordPress functionality to include layout building through the WordPress Visual Customizer. It provides a lightweight set of base options, pre-built templates and widgets to help you create your own custom websites. Layers can also be extended through child themes and plugins for advanced styling and functionality. Because Layers is free, open source, and a top notch WordPress framework that complies with the highest development and coding standards, theme developers are getting on board building some really impressive Layers WP child themes. Below is a collection of some of the best premium child themes for the Layers WordPress website builder framework. Klass is a clean and modern photography and portfolio child theme for Layers. The premium theme could be used for creative agencies, portfolio sites, photo studios, freelancers, photography sites and others. The homepage has a large featured image, sections for information, portfolio and more. Its mobile responsive, retina ready, has unlimited color options, Font Awesome, easy customization options, smooth CSS3 animations, revolution slider, Google maps, one click import live demo layout, and more. 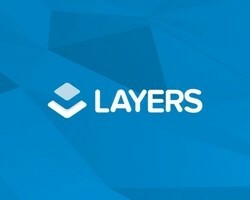 Donate is a charity and non profit WordPress child theme for Layers. The premium theme has a modern and professional design that is versatile enough to be used for a variety of purposes such as charity and not for profit organizations, crowdfunding, political causes, environmental causes, personal causes, business or anything else. Its designed for mobile so looks great on all devices. Other features include: two different versions, grid style posts, Font Awesome icons, cool navigation styles, gallery and events sections, parallax effects, nice jQuery animations, fundraising progress bar, crowdfunding section, Google fonts, plus all the other features and benefits of Layers that allow you to total control of you layout and design with a point and click interface so you don’t need to know any code. Hostme is a multipurpose business style child theme for the Layers WP Framework. The premium theme has a clean, flat and mobile responsive design and would be ideal for web hosting websites, business and company sites, portfolios, or anything or project. The theme adds many shortcodes and widgets to give you more options for customization. Some of the other key features of the theme include: WHMCS Bridge compatibility, business hours plugin, slider plugin, 5 header styles, FontAwesome compatibility, 1-4 column portfolios, right or left sidebars, Google fonts, 9 post formats, progress bar, Google maps layers widget, advanced options panel, full or boxed layouts, full width parallax backgrounds, custom widgets and much more. 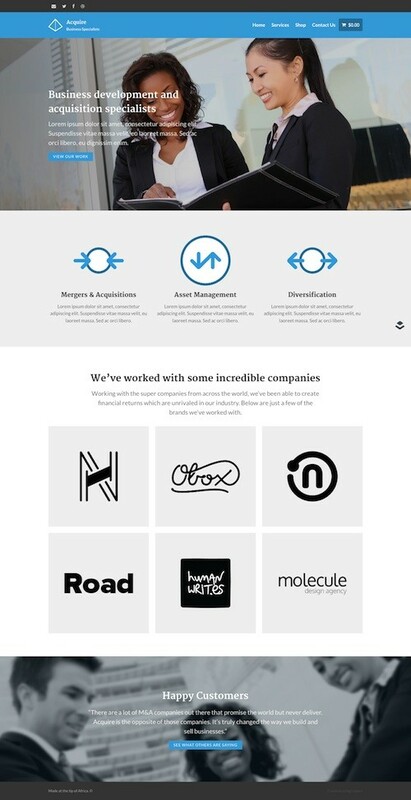 Highwire is a multi-purpose business and corporate style child theme for Layers and coded with HTML5, CSS3 and the latest version of Bootstrap. 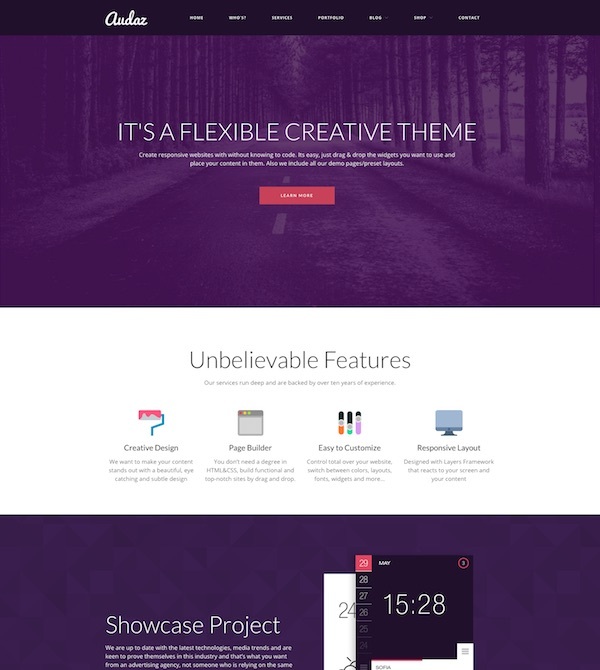 The theme is easy to customize and comes with 3 unique homepage layout styles, 4 creative portfolio styles, revolution slider, more than 20 Layers WP widgets, 100% responsive design, retina ready, advanced theme options, and more. Miresume is a CV and resume child theme for Layers WP that allows you to easily create an online resume, CV or personal portfolio website to help you land or job or attract potential clients. The premium child theme has a modern and minimalist design for showcasing your skills, talents, experience and portfolio of work. Some of the key features include: horizontal one page scrolling, a fully responsive design, various background options (gradient, YouTube video, slider), carousel slider, portfolio, unique menu style, skills progress bar, contact form, various icon options and more. Zen is a multipurpose one page website child theme for Layers. It has a simple but bold design that would be suitable for small corporate, studio, agency, creative and other small business websites. The homepage features a slider followed by sections for your services, business information, contact, map and other important details. Lace and Sole is a WooCommerce child theme for Layers. It has a hip, bold and stylish design that’s suitable for any retailers looking for a great looking design. It’s mobile friendly with a responsive design and retina ready. The homepage has a large featured slider and sections for latest / featured items, product profiles and other information about your shop with a map. This child theme is created by Obox the developer behind Layers and is licensed 100% GPL. 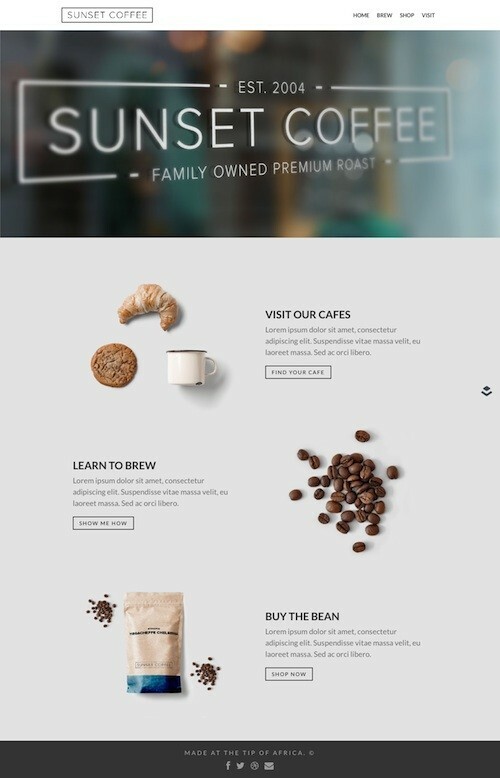 Sunset Coffee is a simple and elegant Layers child theme ideal for coffee shops, cafes, restaurants, bars, pubs, or in fact any small business wanting a modern and stylish website. The homepage has a large featured image and sections for information about your products or services. Integrated WooCommerce support means you can also a shop section or use it to build a complete ecommerce store. This child theme is created by Obox the developer behind Layers and is licensed 100% GPL. Acquire is a professional looking business and corporate child theme. It has a clean and modern flat design that will make a great first impression and is suitable for businesses and corporations of all types. The homepage has a nice featured slider for eye-catching images along with sections for information about your products and services. It is compatible with WooCommerce so you can also sell products or services from your website. This child theme is created by Obox the developer behind Layers and is licensed 100% GPL. Weather is a slick one-page layout child theme for Layers designed for showcasing phone or iPad app. You could of course use it for showcasing any other type of product or software. It has a modern and focused design that’s mobile friendly with a responsive layout and is compatible with WooCommerce. This child theme is created by Obox the developer behind Layers and is licensed 100% GPL. Simplissimo is a cool and unique blog magazine style child theme for Layers. The premium child theme has a light and bright contemporary design and a range of nice features including: an attractive featured area slider, 4 different homepage layouts, a full-width Instagram footer area, an abundance of post & layout options, Google web fonts, 100% responsive layout, Bootstrap based, gallery posts, video posts and more. Synchrony is a modern corporate and business style child theme for Layers. Some of the key features include: advanced color settings so you can easily make your business brand, mobile responsive design, lots of layout options, Google fonts, different header layouts, touch optimized slider, Google maps integration, widgetized sidebars and footers, Contact Form 7 support, demo content, translation ready, and more. DOSA is a great looking Layers child theme for restaurants, cafes, coffee shops, bars, pubs, clubs, and other small business websites. The premium child theme has a contemporary and appealing design that will entice people to visit your establishment. Some of the key features of the theme include: and attractive homepage with full screen featured image, reservation system, food and drink menu system (create menu categories, add multiple prices, highlight specials etc), Google fonts, business hours and location details, 5 different header styles, various portfolio templates, Google maps, fullwidth parallax background sections, left or right sidebars, FontAwesome icons and much more.